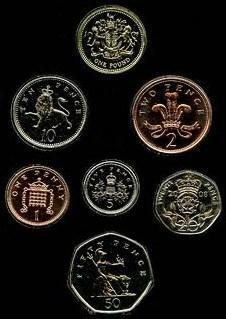 The Quarter sovereign is a commemorative British coin denomination whose introduction was announced by the Royal Mint in January 2009. Comprising 2 grams of 22 carat or 0.9170 fine gold, the 13.5 mm diameter quarter sovereign is the smallest modern legal tender British gold coin. It is a quarter of the weight of a sovereign with a AGW of 0.05896 troy oz. As of 2019[update] it continues to be minted. ^ "Quarter Sovereigns - Available February 2009". goldsovereigns.co.uk. Retrieved 2017-05-30. ^ "Quarter-Sovereign 2017 | Gold Sovereigns | The Royal Mint". The Royal Mint. Retrieved 2017-05-30. This coin-related article is a stub. You can help Wikipedia by expanding it. The Royal Canadian Mint is a Crown corporation, operating under the Royal Canadian Mint Act. The shares of the Mint are held in trust for the Crown in right of Canada. The quarter, short for quarter dollar, is a Canadian coin worth 25 cents or one-fourth of a Canadian dollar. It is a small, circular coin of silver colour. 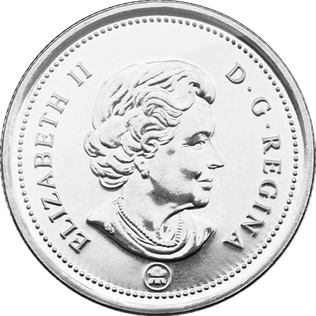 According to the Royal Canadian Mint, the official name for the coin is the 25-cent piece, but in practice it is usually called a "quarter", much like its American counterpart. The coin is produced at the Royal Canadian Mint's facility in Winnipeg, Manitoba. The Australian two dollar coin is the highest-denomination coin of the Australian dollar. It was first issued on 20 June 1988, having been in planning since the mid-1970s. It replaced the Australian two-dollar note due to having a longer circulatory life.